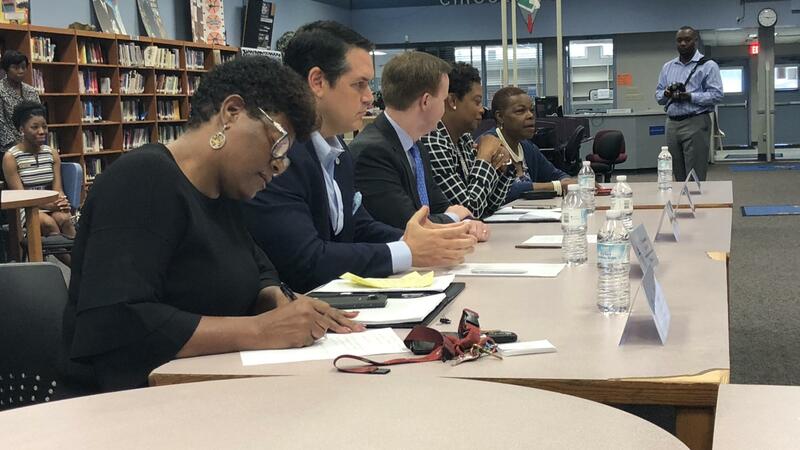 Jacksonville lawmakers listen to Duval students' concerns at Ribault High Wednesday. 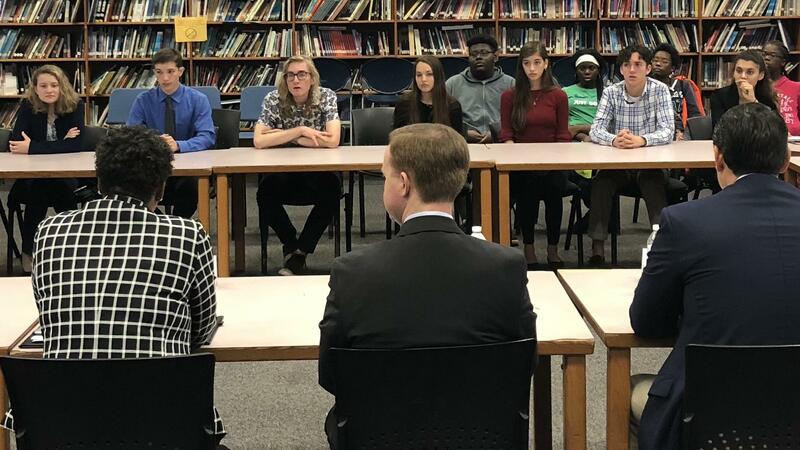 The students and lawmakers met after many of the students had traveled to Tallahassee to testify about a massive new safety bill but not all of them were able to speak. The main topics of conversation: How do lawmakers plan to keep students safe? And how can students have their voices heard? 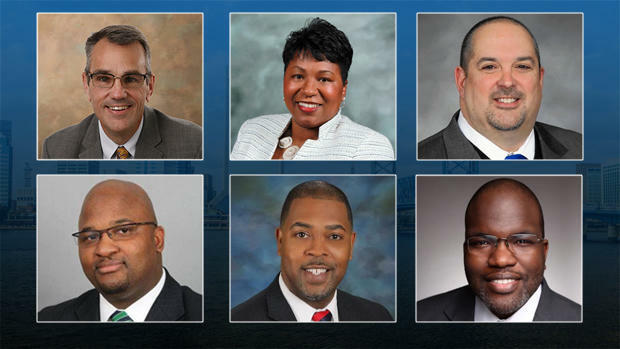 The Northeast Florida delegates who attended were: Sen. Audrey Gibson (D-Jacksonville), Rep. Cord Byrd (R-Jacksonville), Rep. Tracie Davis (D-Jacksonville), Rep. Kimberly Daniels (D-Jacksonville) and Rep. Clay Yarborough (R-Jacksonville). After the Marjory Stoneman Douglas mass shooting in February, lawmakers scrambled to pass a school safety bill dedicating $99 million to making school buildings safer; requiring police officers or trained, armed individuals at all schools; and changing gun policies, including the banning of bump stocks. Bump stocks are attachments that allow semiautomatic rifles to fire faster. Students asked lawmakers about the measures and how they’d be implemented. Lawmakers (left) Rep. Kimberly Daniels, Rep. Cord Byrd, Rep. Clay Yarborough, Rep. Tracie Davis and Sen. Audrey Gibson. Byrd said some of that is still being figured out, adding that the bill created a state commission that includes parents who lost children in the shooting, to recommend legislation. Mandarin High junior Connell Mosley asked how a single school resource officer could be effective on spread-out campuses like his. Davis said it’s a tough problem to solve, and properly securing schools will be different for each building, saying in some cases it might mean adding fencing. “It's going to feel different because there are going to be measures that we need to put in place to harden schools,” Davis said. “Everything will boil down to resources, the financial dollars we can put into it." “It costs money,” Gibson said. 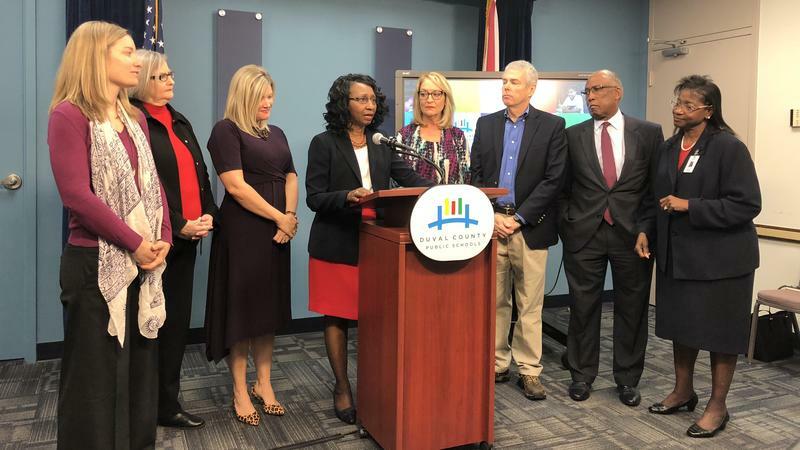 State lawmakers talk to Duval County students about school safety legislation. Another student asked why there hasn’t been an emphasis on metal detectors. 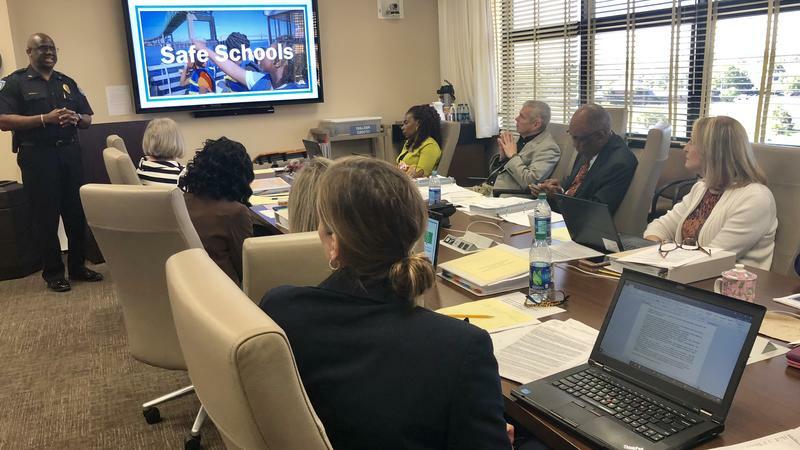 Yarborough pointed out that’s an avenue individual districts can choose to take because “school hardening” dollars can be used for a number of modifications, including bulletproof glass and lock systems. Davis said she agrees with Thomas, adding that banning assault-type weapons is an issue she’s been fighting for. “The movement of voices that we’re hearing from schools is they want the assault-type weapons banned and I don’t know, to be honest, if we’ll ever get there,” Davis said after the event. Byrd encouraged students to develop a method, like a Facebook page, to gather input at school and filter it up through the School Board to legislators. Daniels said she’d happily meet with students to hear their concerns. She also added she hadn’t been working with School Board members as much as she should due to disagreements and fear, but she wants to change that. “When I first heard about this meeting, my guard was up,” she said. 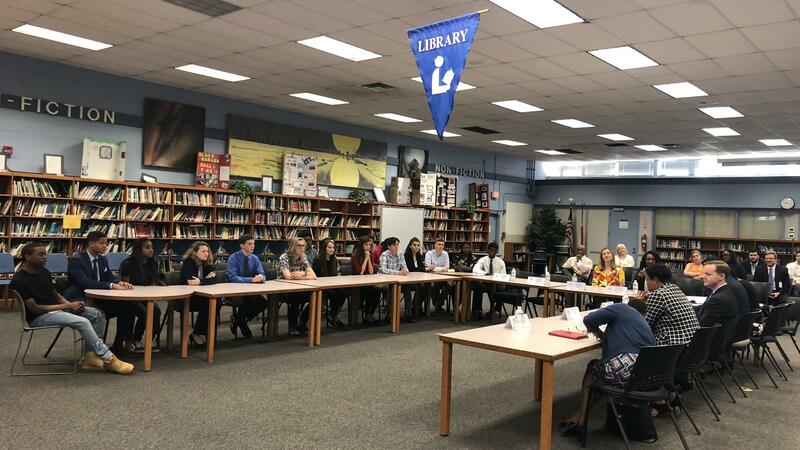 After the meeting, Byrd summed up his takeaway this way: “We’re having a conversation about school safety not only in Florida and in our community but around the nation, and so it was important for me and my colleagues in the delegation to come and listen to students and hear what they’re experiencing." Thomas, the Ribault sophomore, left a little skeptical. “They did what every politician is trained to do. They responded, they kind of went around and they circumnavigated it," she said. Florida Gov. 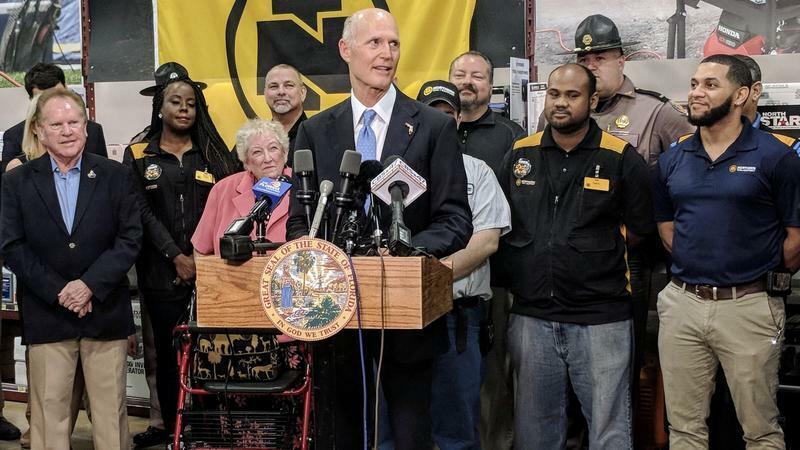 Rick Scott is outlining next steps for school districts, following his signing this month of the Marjory Stoneman Douglas High School Safety Act.